The Metro is a truly versatile chair! 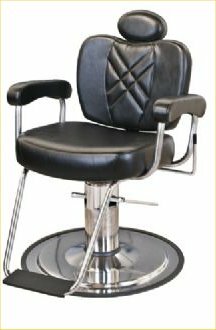 The Barber Chair features a heavy-duty base, rubber tread footrest, reclining back, & headrest ... shown left, largest image. Pictured far left, bottom, the Metro Barber is shown with the optional Collins man-sized logo footrest and with the headrest removed. 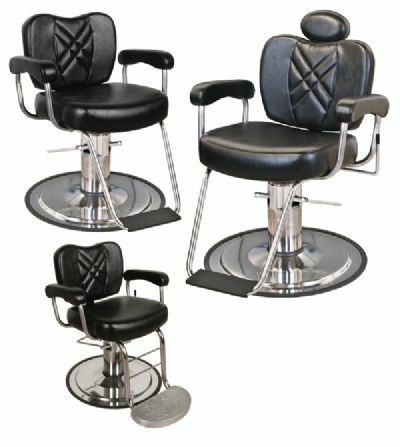 Shown far left, top, is the Metro Men's Styling Chair w/ heavy-duty base, rubber tread footrest & fixed-position back. Seat cushion is 4" thick & 22" wide between arms. Choose a standard color or special-order your color.